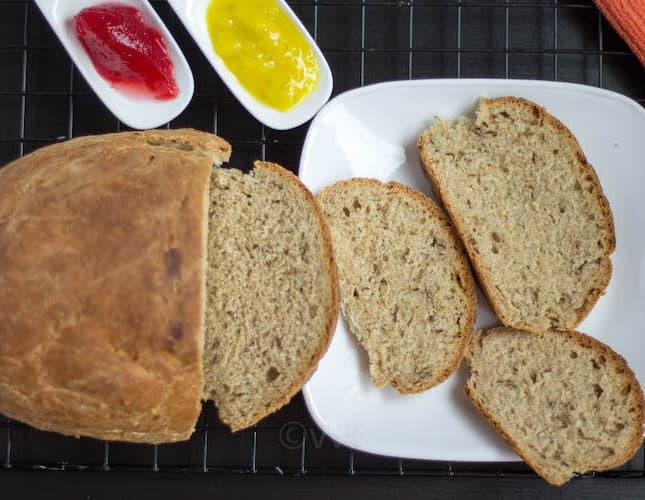 Irish Soda Bread – Egg-free, yeast-free, oil and butter free no rise bread made with just four ingredients. 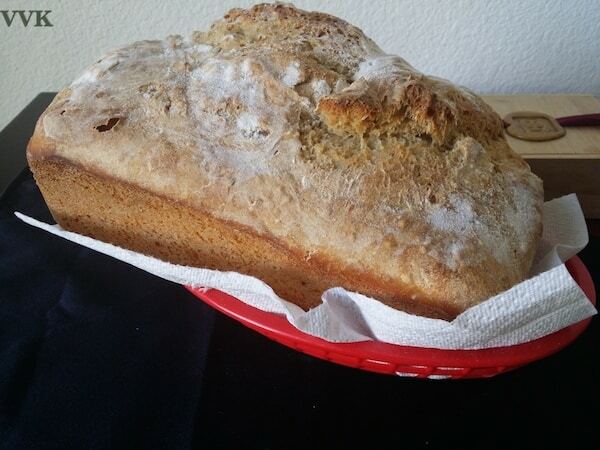 Check out this simple eggless Irish soda bread recipe with detailed step-wise pictures. 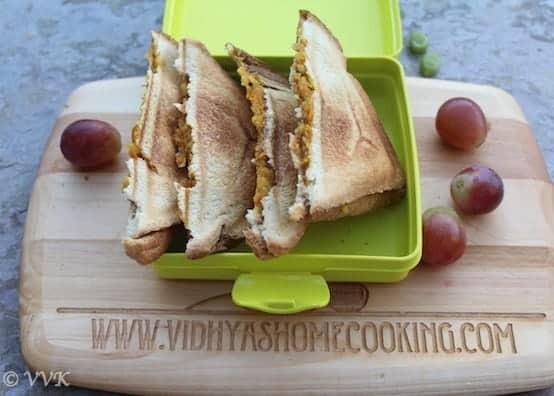 Now making a toast or sandwich or bread pizza with fresh bread is so easy. 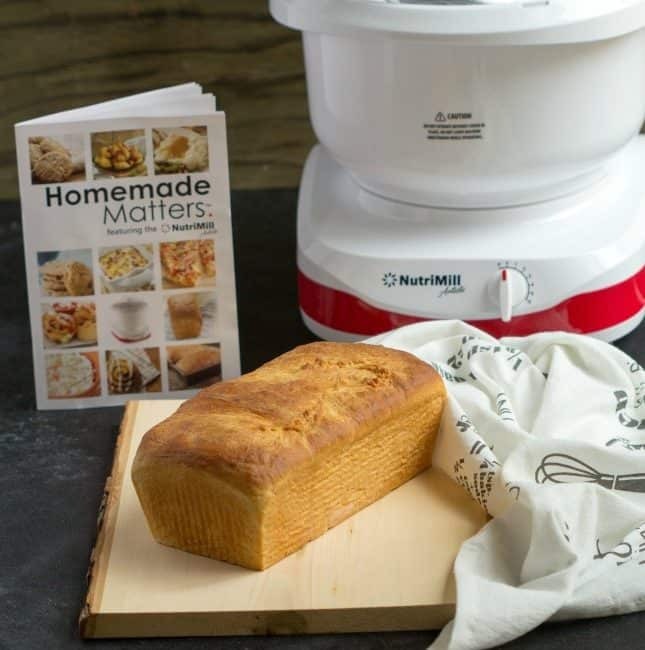 Today I am going to share how to make the simple and classic homemade white bread with bread flour and also how I kneaded the dough using my NutriMill Artiste. Yayyyy!!! We are in the last recipe of this baking marathon. 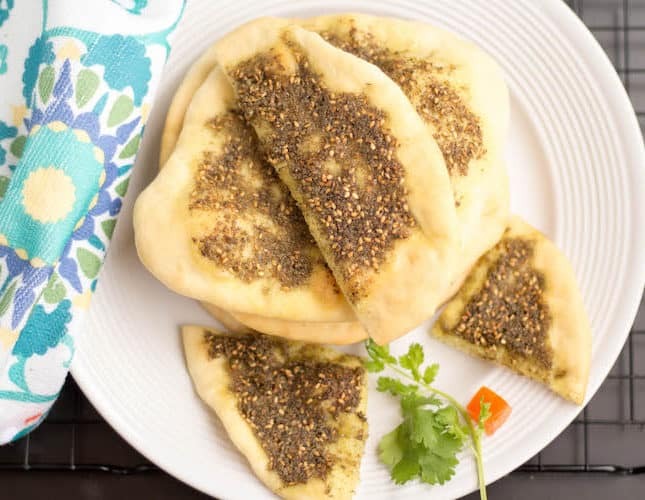 For Z, I am going to share popular pita bread from Lebanon – it’s the Zaatar bread or Zaktar bread. It is also known by the name manakish zaatar. It’s flatbread topped with Zaatar spice mix. To simply put, it’s the Middle Eastern delicacy similar to pizza/focaccia…. 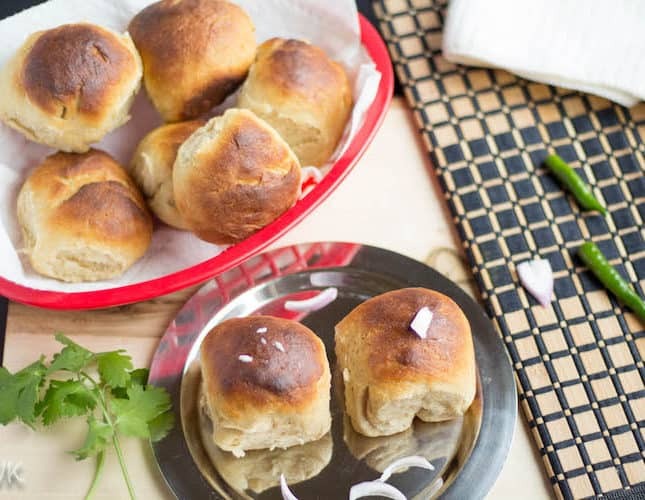 After Gujiya, here is my second recipe from our India – Pav Buns or as the title says Whole Wheat Pav buns with vital wheat gluten. Homemade Pav buns were on my to-do list for quite a long time and what’s better than posting it during the blogging marathon? So here comes, whole wheat pav buns for the alphabet W.
After two cakes, I am back with my yeast based bread. This time it’s the famous Czech Christmas bread called Vanocka. 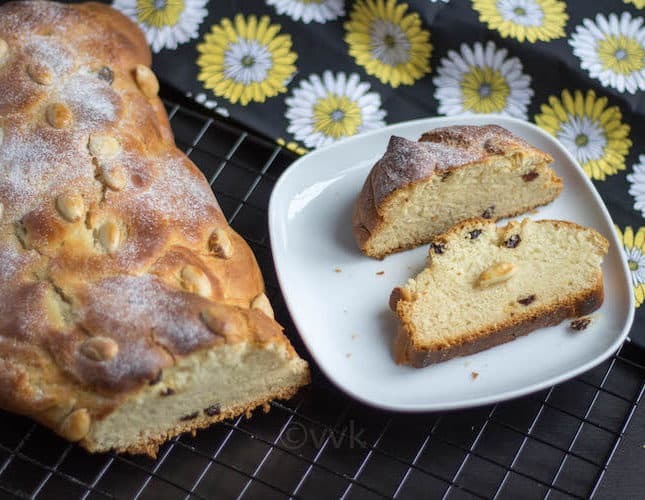 It’s braided sweet bread with blanched almonds and raisins. As I managed to prepare a decent challah, I thought giving it a try to the multi-layered braided Vanocka. Today’s recipe is a “naan” recipe from Persia called – Obi Non. Obi non or lepyoshka is a kind of flat tandoor bread popular in Afghan, Tajik and Uzbek cuisine. It is shaped like a disc and comparatively thicker than naan. There are different varieties of Naan, and it originates from Central and South Asia with influence from the Middle-East. I am going to share one of the naan varieties called obi non which is quite popular in Uzbekistan. I always learn a lot of new recipes from this month long marathon. In the previous years, I picked safe themes. But this year, I had to come out of my comfort zone and look, I started to explore the recipes from all over the world now. 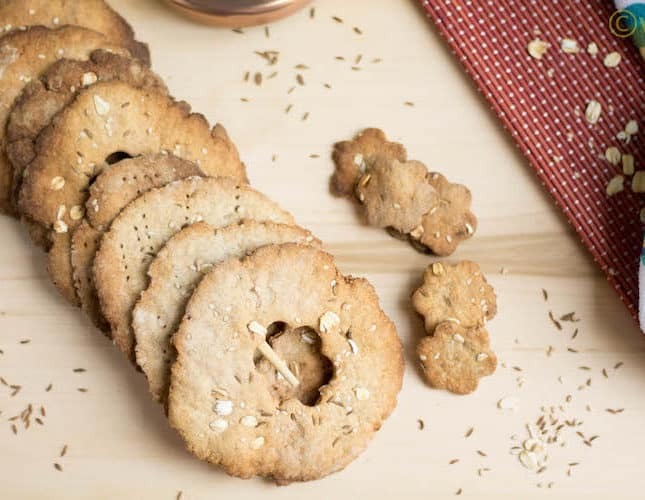 :-) For the alphabet K, I picked a crispbread recipe which is more like a cracker recipe, from Sweden. It’s the Knäckebröd bread prepared mainly with rye flour. We are on the 9th day of the Baking from around the world theme. 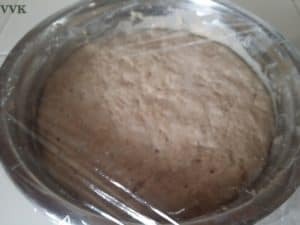 I know I have been posting bread recipes with yeast and that takes more than 2 hours to prepare, but today’s bread recipe is super simple. 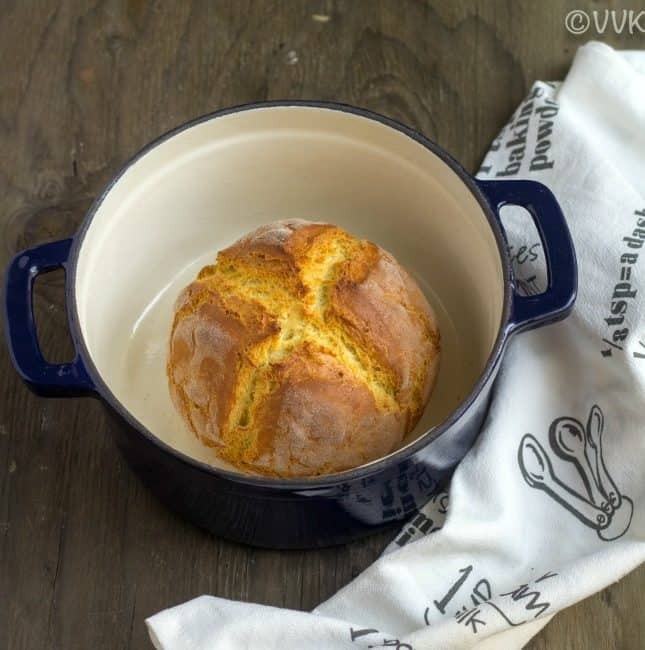 No yeast, No kneading and no waiting time required either. All you need is two main ingredients – Ice Cream and Self-Rising flour. Mix them and bake them. 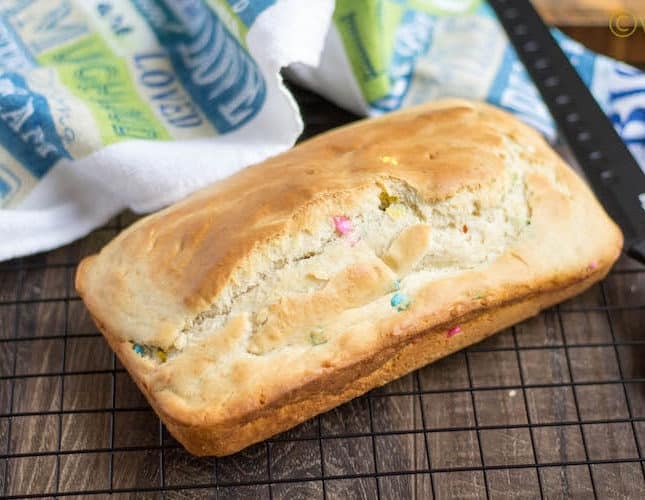 Viola – Ice cream bread is ready. :-) Yes, it’s I for Ice Cream bread today. 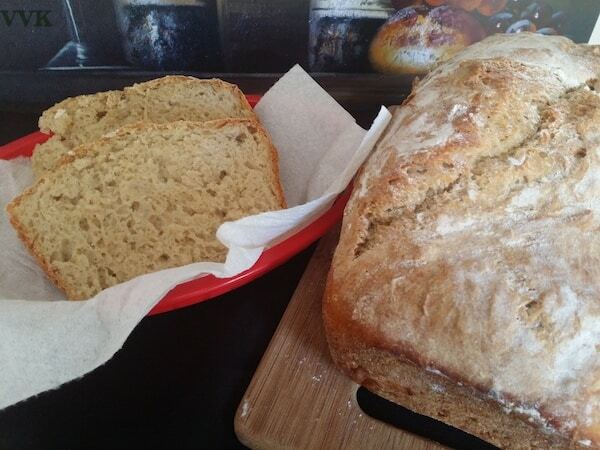 Another yeast-based bread recipe from Chile. 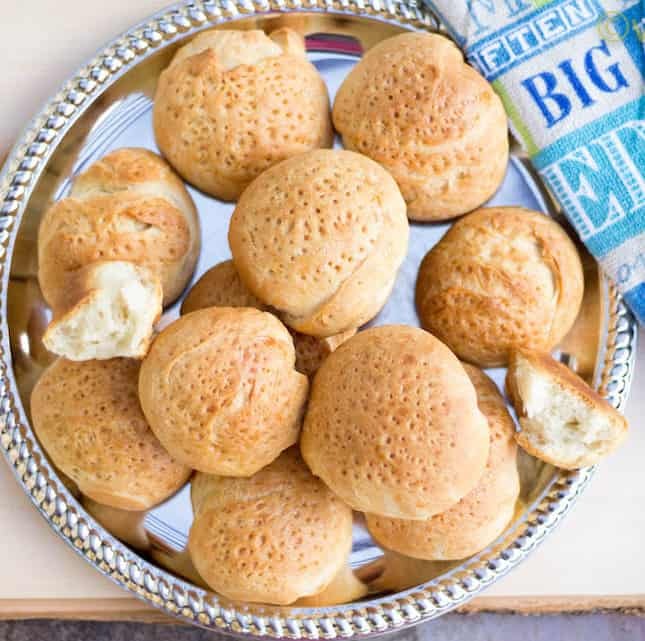 Hallullas are chilian flat round baked bread / soft biscuits perfect for sandwiches. This time instead of preparing them as bread I made them as buns/rolls so that I can serve them along with butter or jam/spread. I love the bread rolls served on the flight, so thought of mimicking this hallulla bread recipe as buns. 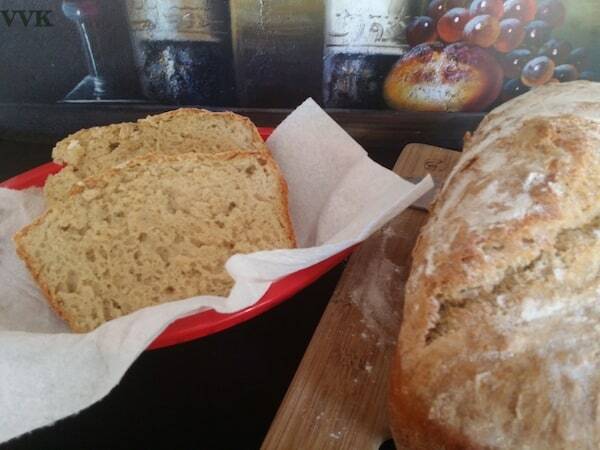 I am going to share a rustic yeast based bread recipe from the land of Italy today. 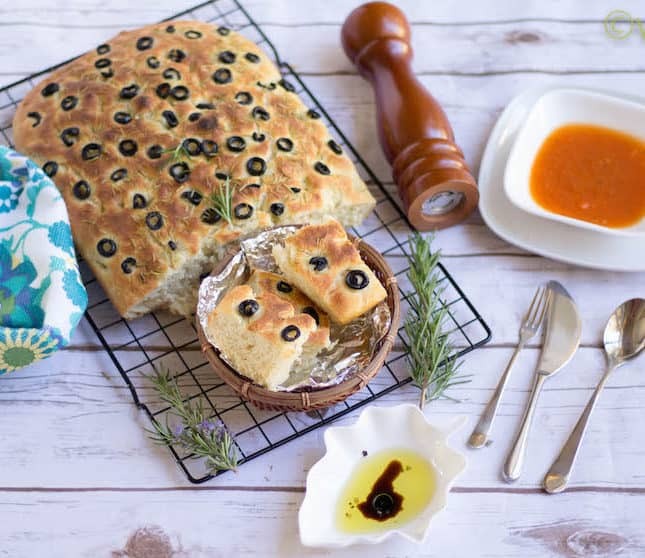 It’s the Focaccia al rosmarino – Focaccia bread with rosemary, and I added olives too. 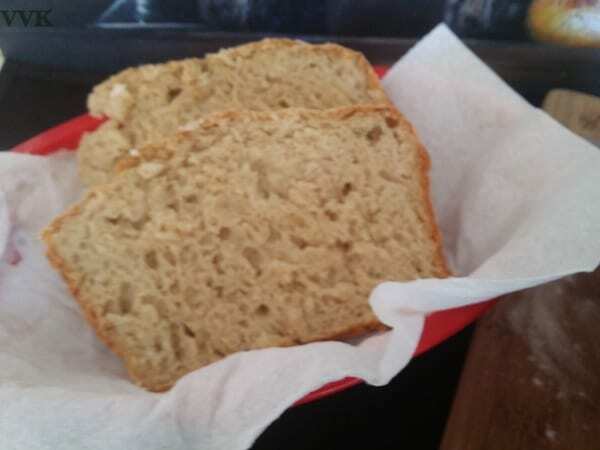 I love the rustic bread they serve as a starter in Italian restaurants. Be it the ciabatta bread or this focaccia; we love it with a generous drizzle of Olive oil and Balsamic vinegar. (I know ciabatta is more for sandwiches) You can serve this focaccia as a starter along with olive oil and balsamic vinegar, or you can serve this as a side for soups and stews. It’s time for guest post. 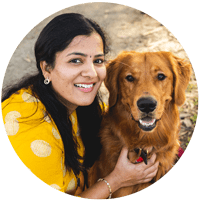 This month’s guest post is from Deepa of Scoop of Tidbits. 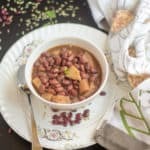 I started to follow her via Instagram and loved her recipes. When I asked for guest post she readily agreed and sent it right away. Thanks a lot Deepa. Today she is sharing Aloo Paratha recipe. 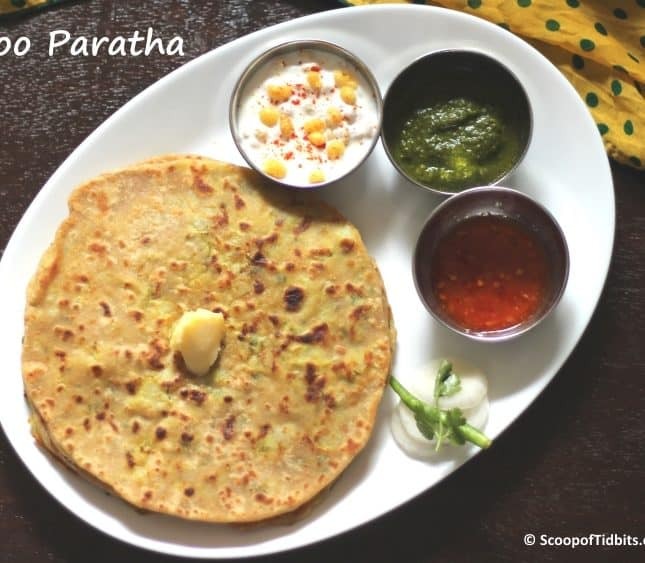 I don’t have that many paratha recipes in my blog and when saw her paratha recipe, I was super elated. So without any further ado, over to Deepa. For this week’s blogging marathon the theme is Regional Cuisine. I picked Madurai and Virudhunagar and now you know why I did the review of this book :-) So I chose Madurai/Virudhunagar for this Regional Cuisine and you will be seeing three street side food from Madurai, as we say Thallu Vandi Style recipes and here is the first one Parotta. We all know Madurai is know for Malli (jasmine flower), Meenkshi Amma Temple and Thirumalai Nayakar Mahal. The city is also called as Thoonganagaram meaning the city never sleeps. So these thallu vandi’s or street side food are very popular and you can find them even at night. 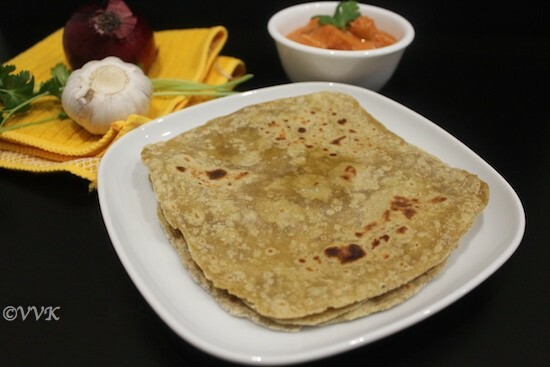 Avocado roti/phulka is a simple, flavorful and healthy recipe. 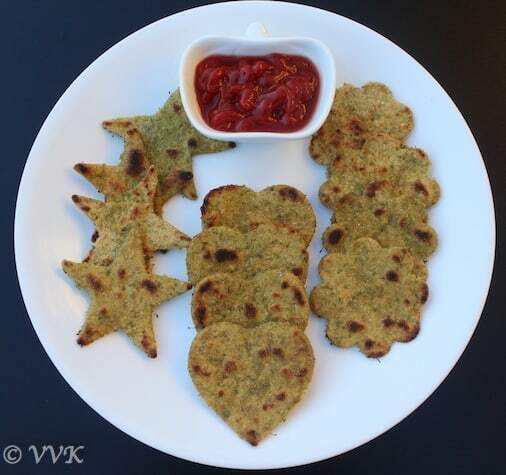 It’s pretty much same as the regular roti except the addition of Avocado and sambhar podi. Err… You read it right. We love that hint of spiciness in the roti. It’s not paratha but at the same time it’s not the plain roti also. 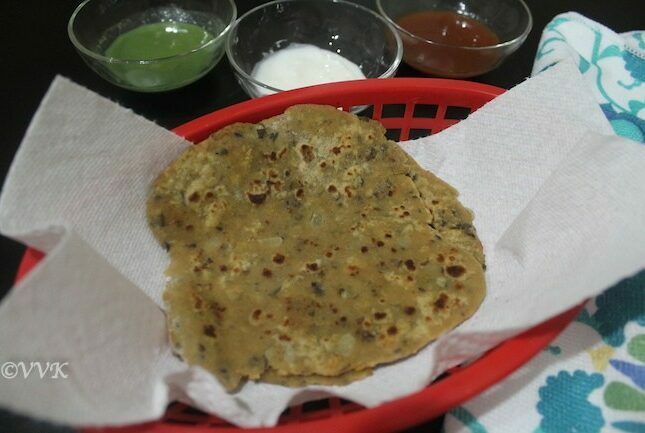 The addition of avocado makes the roti very soft and spongy. 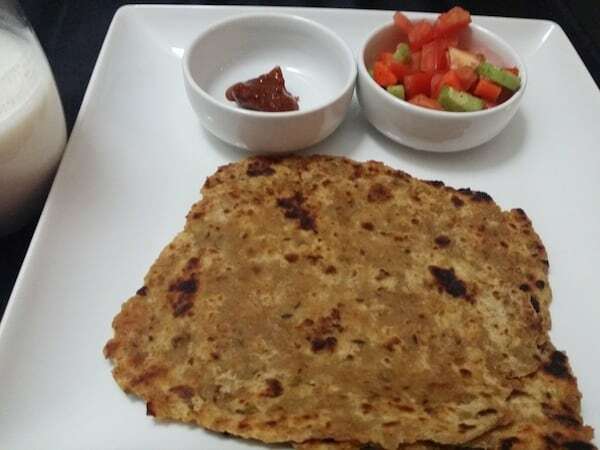 Whenever I cook dal, I always make sure I will have some left overs, so that I can prepare this dal paratha. 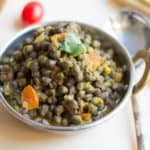 If I cook dal my family knows what will be for breakfast or lunch the next day. It’s the dal paratha. 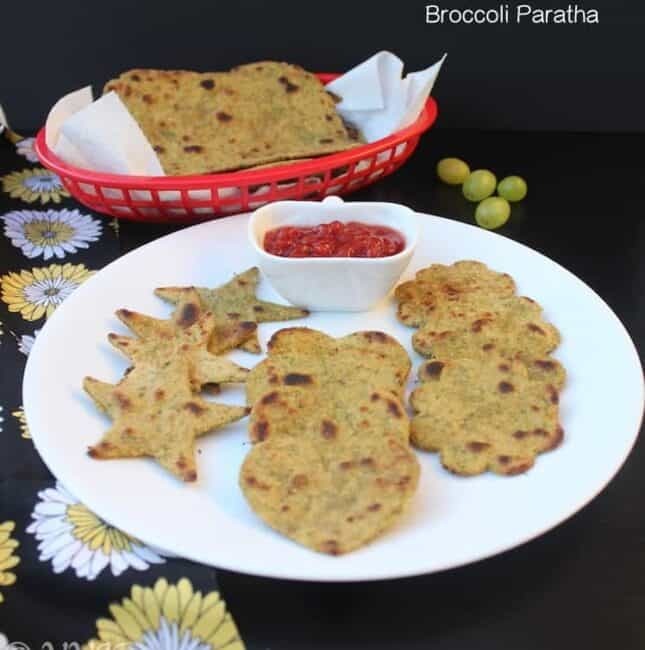 Parathas are great way to sneak in veggies for kids and with this dal paratha you can sneak in dal too. 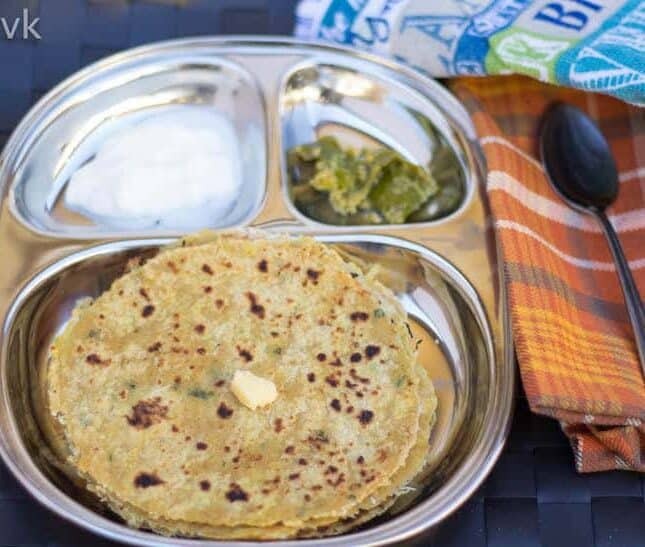 Spicy dals will be the best bet for these parathas. Yayyy.. Posting from chennai :-) Yup reached chennai and before my travelling starts thought of posting couple of recipes. 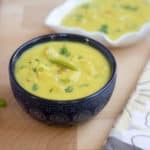 Couple of travelling posts are in its way :-) Before non-recipe posts here is the recipe post. As kiddo says, brussells sprout is small cabbage like veggie loaded with vitamins. 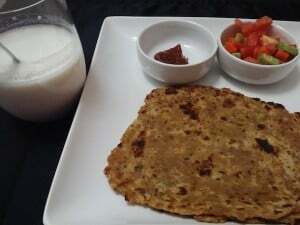 I have tried traditional kootu and then thought of trying paratha. Parathas are the best way to hide veggies. This recipe of mine got published in the “Vizhudugal” magazine. Its a monthly tamil magazine which gets published and circulated in the entire North America. Haven’t received the book yet but friends mentioned it. The difficult thing was typing the recipe in Tamil but somehow managed it. Here is the english version of it and once I receive the book will update the picture. 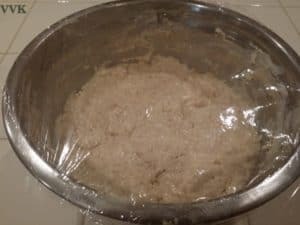 Wheat flour – 3 cups + additional flour for dusting. Clean the Brussels sprouts and chop them finely. Heat the kadai and add 1 tbsp of oil. Once the oil is hot add the cumin seeds. As they start to splutter add the dry masala (daniya powder, chilly powder and turmeric powder) and cook for couple of minutes till the raw smell goes. Now add the chopped brussels sprout and sprinkle 3 tbsps of water. Cover and cook for 5-7 minutes. Remove the lid and cook for another couple of minutes till the water evaporates. Thats it the stuffing is ready. This can be used as a side for rice also. Now let the curry cool and mix this with 3 cups of wheat flour. Add salt and water and knead well to the paratha batter consistency. Divide into 10-12 balls and roll them. If required dust with additional flour. Now heat the tava and place these rolled parathas and spread little oil. Let it cook for a minute and flip. Let it cook for another minute on the other side. If required add oil. Once both sides are cooked, thats it. Yummy parathas are ready. Welcome to the 13th day of baking mania. 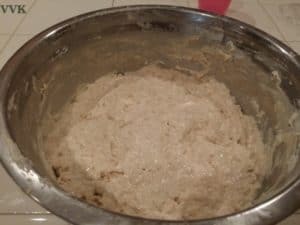 When I joined this blogging marathon group last year, they had a theme called “Tame the yeast”. It ran for couple of months. I was wondering why they have this theme and was thinking is it so hard to tame the yeast? Oh mannnnn… I realized that tt is indeed very hard to tame this tiny yeast. I have one big disaster story to share but will keep that for next month. :-) But I wanted to try one bread at least in this baking marathon. 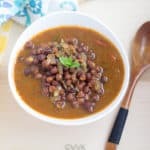 So took this recipe from Varada’s kitchen. Ok, what do I say about her and her breads. Such an artistic baker. Note: I mixed the flour and kept the dough overnight to rise. The temperature plays a major role. As the temperature was cold here it took me 10 hours for the flour to rise. Sift both the flours in a large mixing bowl (make sure it has enough space for rising). Add all the dry ingredients and add water and oil. Whisk until all the ingredients are mixed together. You don’t need to knead. Spread some oil on top and cover it with plastic wrap and set aside. The dough will be raised twice as its original volume. Now mix the dough nicely. 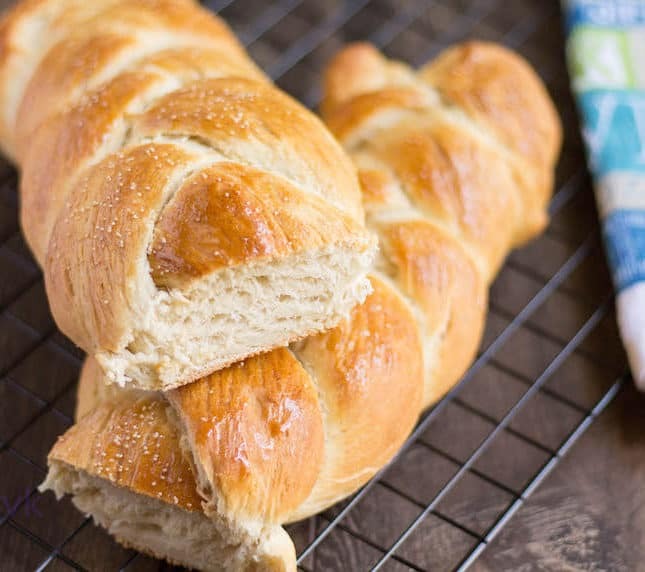 Fold it couple of times and again no need to knead. Sprinkle some flour on top and cover it with oiled plastic wrap again and let it sit for couple of hours. The dough will raise again. Preheat oven to 375 F during the last 15 minutes of the rise. Bake it for up to 5- -60 minutes. I got the golden crust at 50 minutes. I got this idea of roti rolls from Ani. 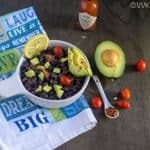 Best way to sneak in vegetables and easy to pack for lunch also. I wanted to add a little twist to the regular curry so thought of making it like frankie. I wanted to say this is completely my version of aloo frankie. I have never been to Mumbai and never tasted a frankie there. Just including the ingredients according to our likes. I used the left over potato-onion curry for this roll. You can find the recipe here. I used big jeera or fennel seeds while tempering. In one corner, place 1 tbsp of the aloo curry and sprinkle some sev, peanuts and cilantro. Roll it like a burrito as shown in the picture. Thats it yummy and mess free aloo frankie is ready. 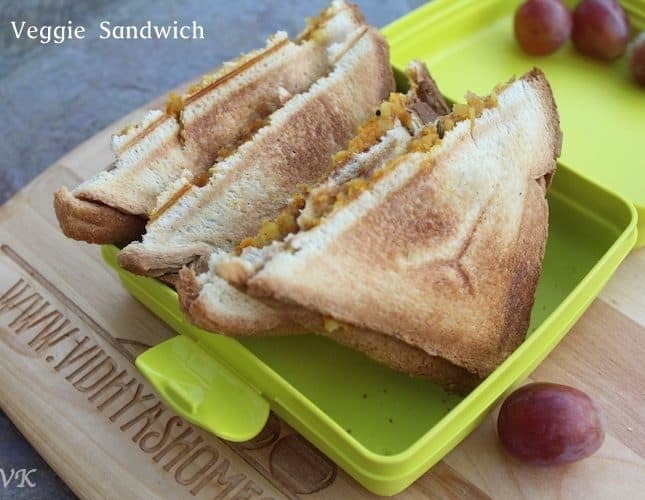 Perfect for lunch box too. For the third day for the bread stubs, I am preparing kulcha. 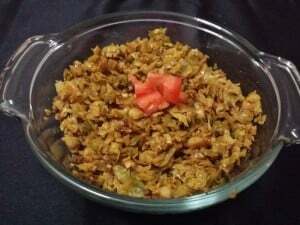 Instead of plain kulcha, I thought of preparing onion kulcha. 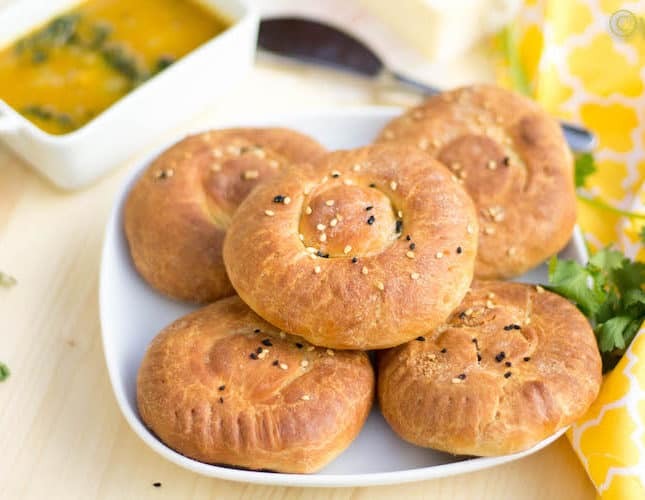 I love kulchas as they are easy to make at home. Its pretty much like bhatoora dough but with less curd and addition of milk. I usually let it sit for 4 hrs and I have used active yeast when I don’t have baking soda and baking powder. It comes out well. 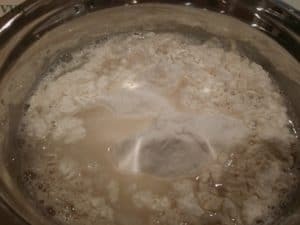 I have tried with and without yeast. Mix the flour, sugar, salt, baking soda, baking powder and 2 tsp of oil nicely. Add the 2 tbsps of milk and yogurt and mix well. It will like corn meal. 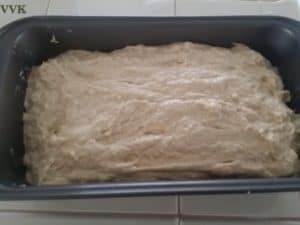 Now slowly add water and mix the flour to form the dough. Make sure the dough is not soggy. Let it sit for 4 hrs. 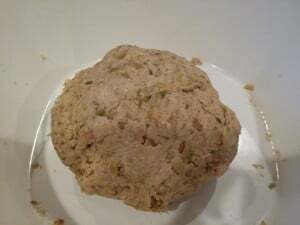 Make balls from the dough and roll into round shape. Now sprinkle a little of onions, cilantro and sesame seeds and roll it one more time so that they all stick together. Now heat the tawa and cook the kulcha as usual like roti. The only thing is spread the oil nicely on the top of the kulcha while flipping them. You can use butter also. Thats it, yummy kulcha is ready. Serve hot with your favorite gravy. Water – 1/2 cup (as required). Mix the corn meal, salt and wheat flour nicely. Now add the chopped onions, green chillies and cilantro and mix well. As I don’t get banana leaf, I go with zip loc for rolling process. Apply some oil in the zip loc cover. Make small balls from the dough and press it in the zip loc and spread it out into thin roti as much as you can. Heat the tawa and cook the roti in a usual way by applying oil. Usually this roti takes 1.5 to 2 minutes to get cooked. Thats it, yummy and crispy roti is ready. Serve hot with butter and saag. 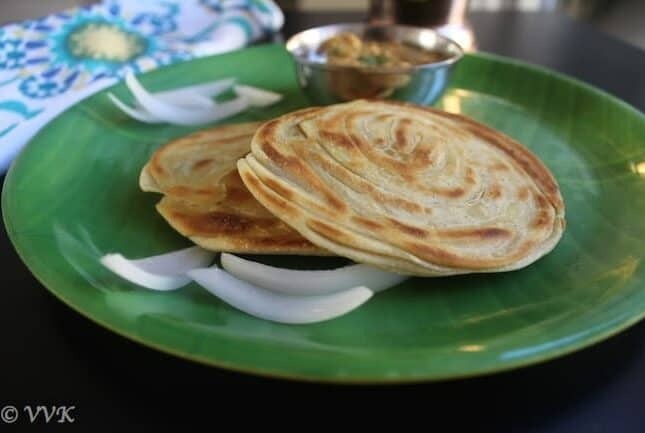 As this roti has onion and chillies, you can eat it with pickle or ketchup too.